The heart of all type of separators consists of one Powerful Electromagnet operating on Direct Current. The iron parts are made of high permeability mild steel and the parts are designed for most efficient magnetic field distribution and to produce maximum force density at a selected working distance from the magnet face. The bottom plate is made of heavy stainless steel plate. It is structurally rugged. The other design features include Class 'H' fiberglass insulated E. C. Grade Aluminum or in some cases Copper wound Coils, vacuum impregnated for higher operating strength and better heat dissipation. The Oil Cooled Magnets are provided with External Oil Expansion Tank and the feature has helped the prevention of Coil Burning. Heat and moisture, the greatest enemies of electromagnets, are effectively controlled by the expansion tank, which assures that the coils are always completely immersed in cooling oil. Competitive units provide space within the magnet housing where damaging condensation forms when moist air seeps in through the pressure relief valve as the magnet cools. The breather provided at the expansion tank traps the moisture and keeps it out of the magnet. Replaceable Stainless Steel Impact Plate to prevent damage to the magnet face. The Air Cooled Magnets are provided with proper ventilation for free flow of air filters provided in certain cases. The most important factor in the selection of the proper size of a Magnet is burden depth, belt width, suspension position, size of tramp iron, speed of the belt, suspension height and type of the material carried by the Magnet. The following information is required to make the proper recommendation. Heavy Duty Suspended Magnetic Separator. It is economical to install and operate. This is a very basic equipment and as it has no moving parts, it is very sturdy. Mount the unit at an angle over the material discharge point, or parallel to and above the conveyer line. There is no need to modify the existing conveyer installation. 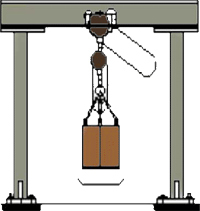 The installations are made with the Magnet suspended parallel to and over the conveyer, where it is not feasible to locate the magnet at an angle over the discharging pulley. In this cases as the tramp iron must be pulled through a fairly sizable bed of material, it is usually necessary to install a larger and stronger Magnet. In either installation, discharge of accumulated tramp iron from the Magnet is fast and easy. Operator has to just move the magnet away from the conveyer, and turn off the current. The tramp iron will be dropped. * See Self Clean Suspended Magnetic Separator for easy self cleaning features.